Republican candidate Bob Vander Plaats says if he’s elected governor, he’ll shoot for an early pay off of about $800 million in borrowing that Governor Culver pushed his fellow Democrats in the legislature to approve this spring, but the state treasurer says that’s not possible. Culver describes the so-called "I-JOBS" program as a state-level economic stimulus, but Vander Plaats says it’s a "borrowing scheme" that Iowans do not support. "I think it was the wrong move by this governor and that’s why I’ve said that it would be my goal that in my first term as governor that we would pay off the I-JOBS bond, that we would not shackle a future generation with debt," Vander Plaat says. "We would not limit our potential to fund our priorities here." For decades the state has issued bonds to investors as a way of raising money and State Treasurer Michael Fitzgerald says Vander Plaats’ idea won’t fly. First, the terms of the deal stipulate the state would pay a penalty for paying off the loans — the bonds — early. Secondly, the deal calls for a specific kind of state revenue to repay the investors. "We don’t have any money to pay them off early with," Fitzgerald says. "These bonds are going to be paid off over 20 years with gambling revenue — $42 million of gambling revenue each year — so if you want to pay them off now, how do you do that?" Fitzgerald, who’s a Democrat, suggests financing for a new, maximum security prison in Fort Madison and the renovation of the Iowa Veterans Home in Marshalltown could be endangered by Vander Plaats’ idea of an early pay off. "We just borrowed $600 million in bonds and if he wants to pay them off in a couple of years, how are you going to do that? I mean, because we’ve already made these committments, are you just going to go back on some of the committments including the prisons and the Veterans Home and stuff like that?" Fitzgerald asks. "…And there would be a penalty." Before Fitzgerald made his comments, Vander Plaats told repoters he might consider reviewing the state’s entire portfolio and pay off bonds that are older and which carry a higher interest rate. "I think what we need to do is say, ‘No. We’re going to be responsible here…We’re going to start paying down debt so we’re not shackling a future generation with debt,’" Vander Plaats said during a news conference at the statehouse. "But also we’re not going to limit Iowa in funding its priorities because when you have to keep paying down that bond, just like you guys know in mortgages — you have to keep paying that off — it limits some of your other priorities." Vander Plaats officially kicked off his third bid for the Republican Party’s 2010 gubernatorial nomination yesterday in his hometown of Sheldon. "I’ve got to tell you for those of you who didn’t make the trip up to Sheldon yesterday we shocked the state because we announced we’re running for governor," Vander Plaats joked this morning. "Nobody saw that one coming." 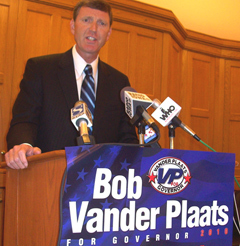 Vander Plaats ran for governor in 2002 and 2006 and in January he formed an exploratory committee to plot strategy for his third campaign.